Quality Strapping manufactures and stocks a full line of strapping kits. Our standard stock item plastic strapping kits are listed below. We also manufacture custom kits (strapping kits with polyester strapping or cord strapping, etc). For our steel strapping kits, please click here. These convenient portable strapping kits are designed in a compact and economical, light weight box. They are ideal for offices, stores, warehouses, and low volume shippers. They contain everything needed for shipping purposes, eliminating the need for expensive tools. 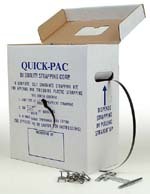 All Quick-Pac strapping kits come complete with 3,000 feet of high quality 1/2” plastic strapping, a sturdy hand-held tensioning and cutting tool. Complete set of instructions and illustrations are printed on the box. Strapping kits ships in a protective cardboard sleeve to prevent shipping damage. Available in both regular and heavy duty, this complete, self contained strapping kit includes everything needed to handle a wide range of strapping applications. Packaged in a double wall self dispensing carton, Jumbo Kits are ideal for first users and multi location buyers. All Jumbo Kits come complete with high quality tensioner and crimper (plastic sealer) tools. Complete set of instructions and illustrations are printed on the box. Kit ships in a protective cardboard sleeve to prevent shipping damage. QP-JRRD Jumbo Strapping Replacement Kit. Strapping & seals only. 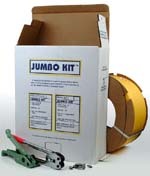 QP-JRHD Jumbo Heavy Duty Replacement kit, strapping & seals only.